The wood in the Mark VIII is 100% real and so are the shift knob and the steering wheel on the 1998 Collector's Edition. You might not think so if you take the panel inserts off and look at the back. The back is plastic. It is a new process that a thin wood veneer is laminated over a composite structure and then a new type of resin is laid over the top to give it the correct finish. It is real walnut burl and if you tap on it you can here the density of it. Now go to the Town Car and tap on it you can hear and feel the difference. That is fake plastic. 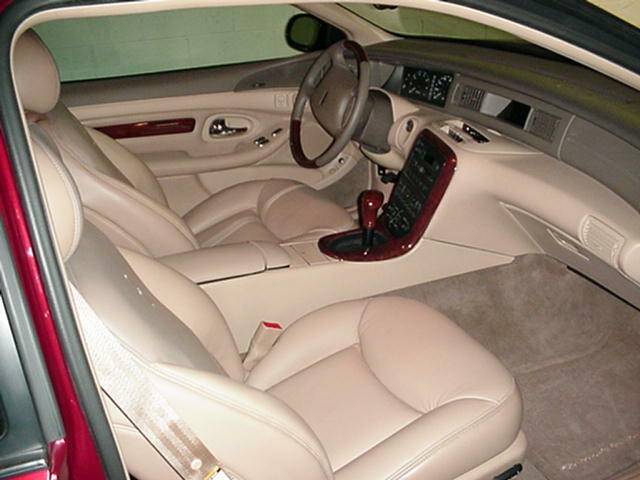 The wood on almost every car such as Lexus, some Jaguar's, Mercedes and Cadillac are real and made the exact same way. They are just different finishes and different types of wood. This lamination process is called appliqué. This is a very expensive process and therfore most manufactures don't like to use this process. The 1998 Collector's Edition wheel is formed out of 1/8 inch strips bonded together to make the wheel. You can see the strips if you look closely at the wheel. If you look at a Navigator or any other Lincoln product the only thing that is real wood in any of the cars are the shift knobs and the steering wheel. The dashes and everything else in those cars are plastic wood tone.